For quite some time I wanted to try Avocado chappathi, but was in a dilemma. Finally decided to try it when I saw it in some blog, forgot which one. So here it is, avocado chappathi full full of nutrients. 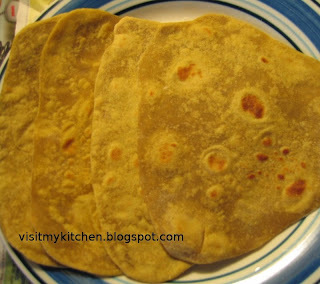 Choose a ripe avocado, scoop and add to the wheat flour, add salt and water and make the chappathi dough the same way u do. Make chappathis in the usual way. Depending on the amount of avocado you add, the chappathis will have a mild green color and the avocado taste. ** To ripen the avocado, you can put it in a brown paper bag / wrap it in news paper and keep outside for a day or two. More better if an apple/tomato is kept along with it. This is a very healthy recepie. I will try it at home.I do find that Avocado as such do not taste good by itself. I suggest a table spoon of cumin powder or Chat masala to be added when kneading the dough. It will remove the raw taste of Avocado. I do that when I make Avocado raita. I am a fan of your blog and do write more. i make this too..infact this is the only thing I tried with avacados..yours looks good..
hi sowmya..looking good and indeed healthy .. i have posted it too ..with gobi mutter.. i too do the same..
Oats Cutlet - Who doesnt love cutlets? Bisibelabath - I love this dish..